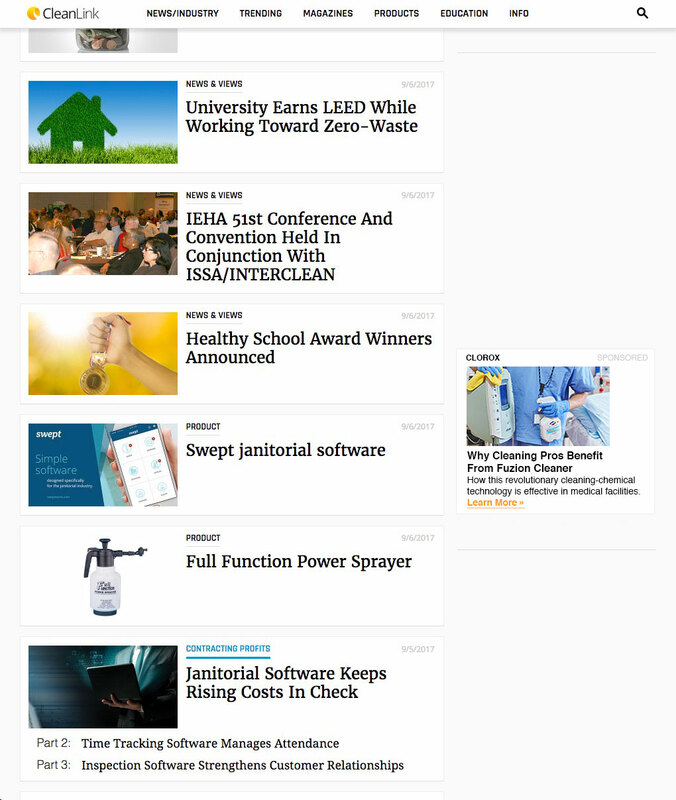 Branded features appear in the feed alongside trusted and topical content from CleanLink. Get your message in front of industry decision makers in this highly visible way. Text File*: Headline (up to 10 words) up to 4,000 words of supplied text* inclding hyperlinks, multiple images, graphs and charts, YouTube URLs. * Content is subject to review and may be edited for length, clarity and style. Branded content is intended to provide useful or otherwise engaging, non-promotional information to cleaning professionals. 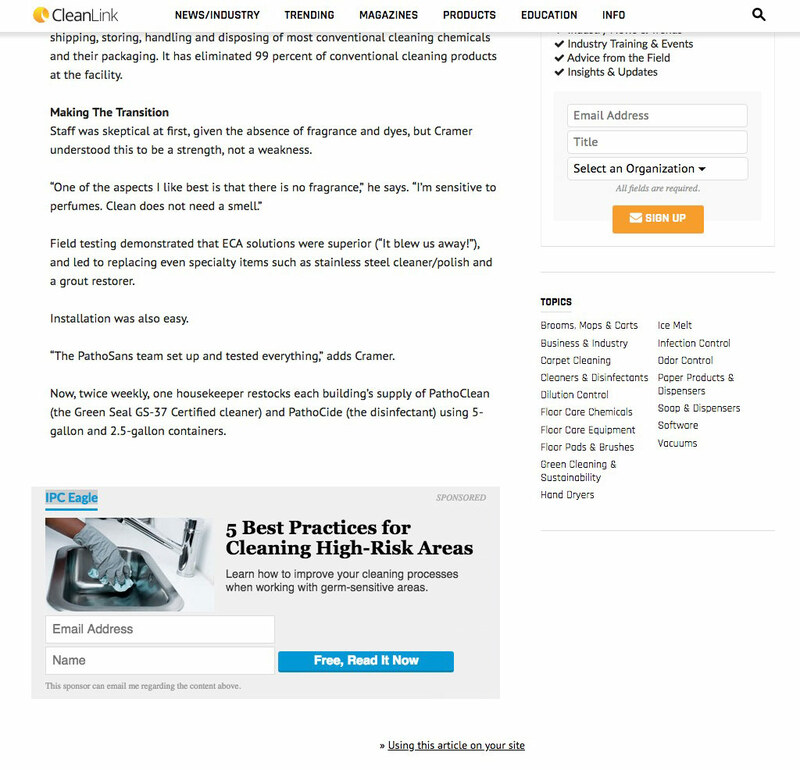 The Buyer's Guide is the go-to product resource for cleaning pros every day. 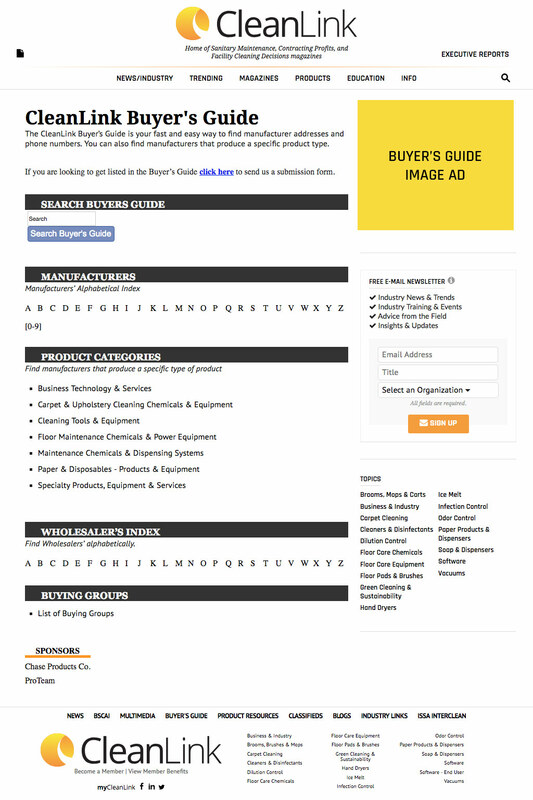 Your image ad is seen on all Buyer's Guide pages. Let your expertise shine by positioning your ad contextually through image and text. 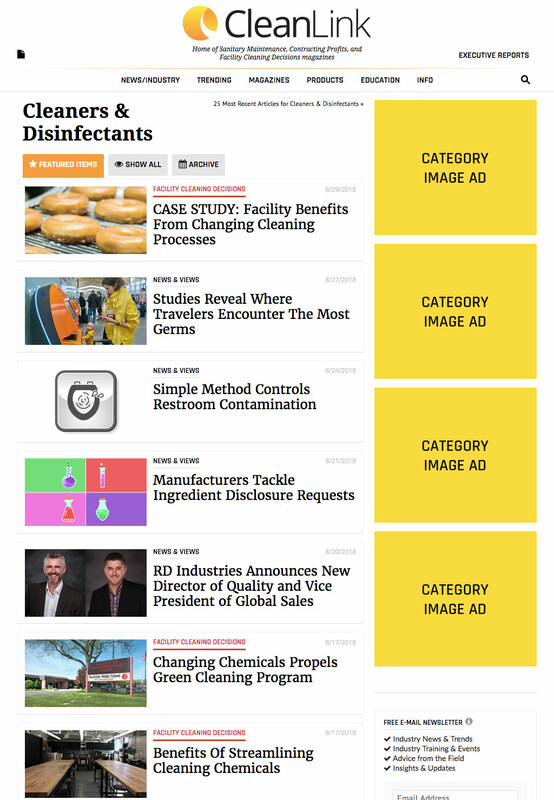 You get exposure on any of CleanLink's 17 category pages with an image ad, plus a text ad in all related articles and news items throughout the site. Get exposure to the specific user you're trying to reach on CleanLink! 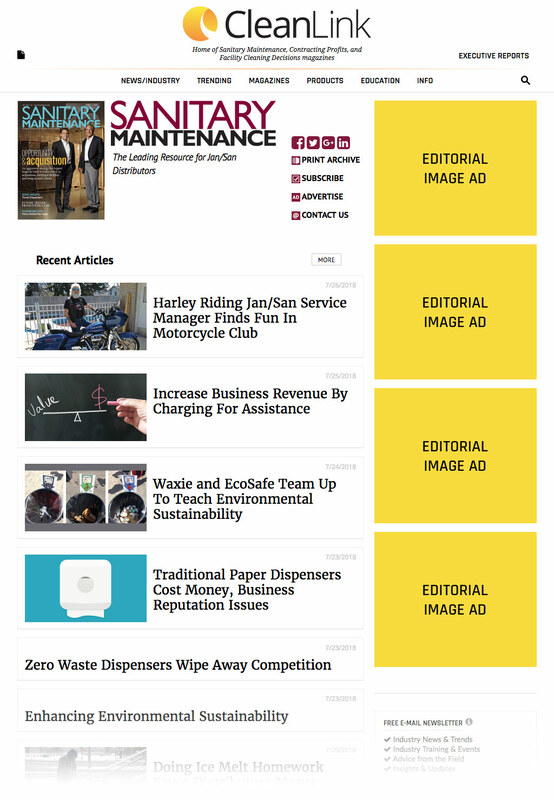 Your editorial image ad appears next to all articles from Sanitary Maintenance, Contracting Profits, or Facility Cleaning Decisions. Feature your product on our highly visible homepage. With this brand-building, traffic-driving opportunity, readers click your ad and go directly to your full product information within your site! 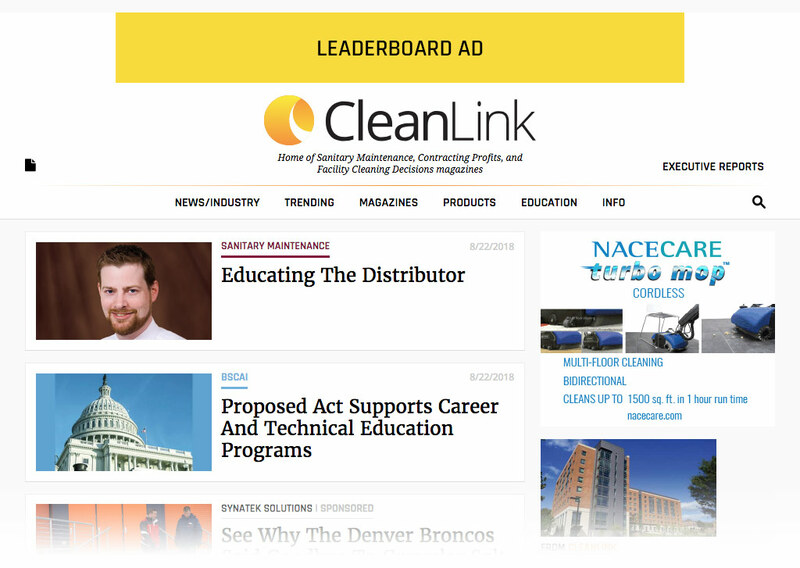 It's nearly impossible for cleaning executives to miss a leaderboard ad because it runs throughout the entire CleanLink website. Your ad gets a quarter of all website impressions. CleanLink is the most trusted news outlet in the commercial cleaning industry, covering all corners of the market. 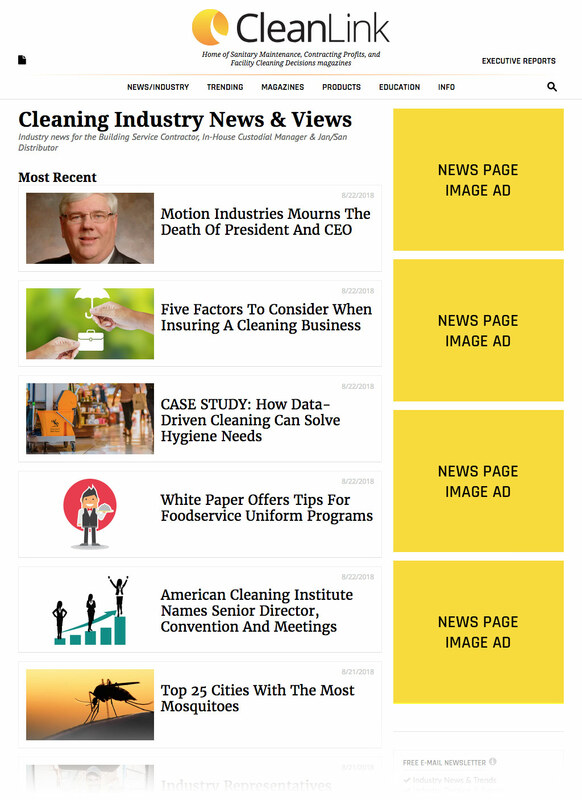 This ad gives your brand visibility where cleaning industry professionals go every day for news. 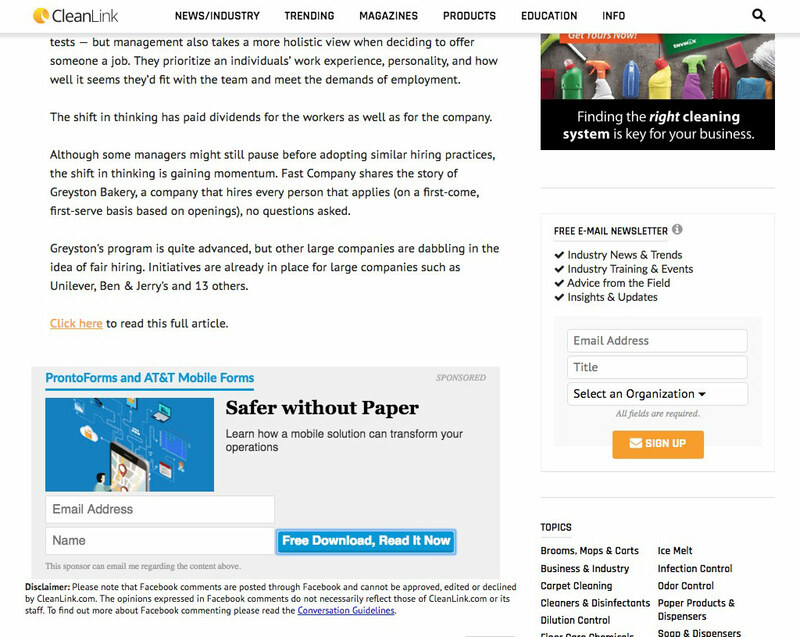 News Image Ads appear on highly trafficked pages of the site. Many CleanLink users access the site from a mobile device. Your ad gets a third of all mobile website impressions to build your brand awareness and increase your web traffic. It's a perfect way to reach on-the-go cleaning professionals. 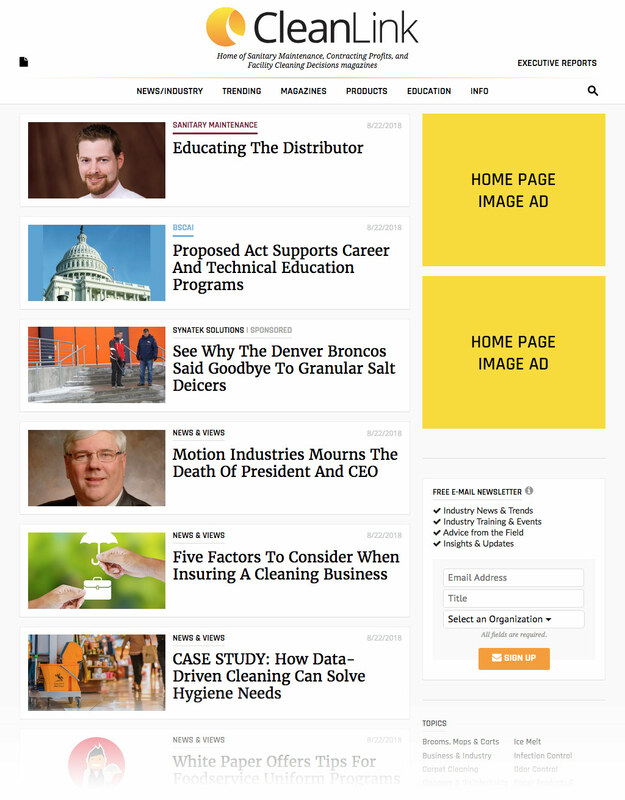 We'll help extend your message by targeting our influential CleanLink audience across the entire web. Stay in front of the people you want to be doing business with. Target top prospects that you want to reach and build mind share. 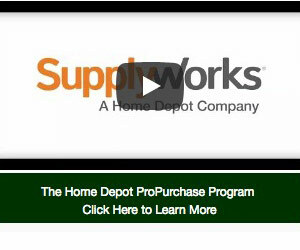 Drive more professionals directly into your purchasing funnel. Our standard retargeting campaign puts you in front of cleaning-industry decision makers, helping you build mind share, create awareness and generate leads. Our market-segment campaign targets cleaning professionals who are actively researching and reading material under one of our cleaning-market brands. This approach let's you refine your campaign even further to focus on just distributors, BSCs or in-house cleaning management. You provide your campaign budget/impressions and campaign duration. Our experienced digital media managers and analysts will custom configure your campaign and make recommendations with your targeting needs in mind. Landing page content must be relevant to the ad and helpful to the user. It must promote transparency and foster trustworthiness. It should make mobile and computer navigation easy and should be fast to load. Ads must name the product, service, or entity being promoted. Image or animated ads must clearly display identifying information such as a product or company name, logo, or display URL on the final static frame (after the animation has ceased). Animated gifs must end after a max of 30 seconds. HTML5 not allowed. HD animaged gifs are not supported. Additional ad requirements apply relating to copyrighted material, prohibited content, spammy ads and the like. Ads must be approved before going live. Raise your profile in the online product showcase that cleaning decision makers trust. 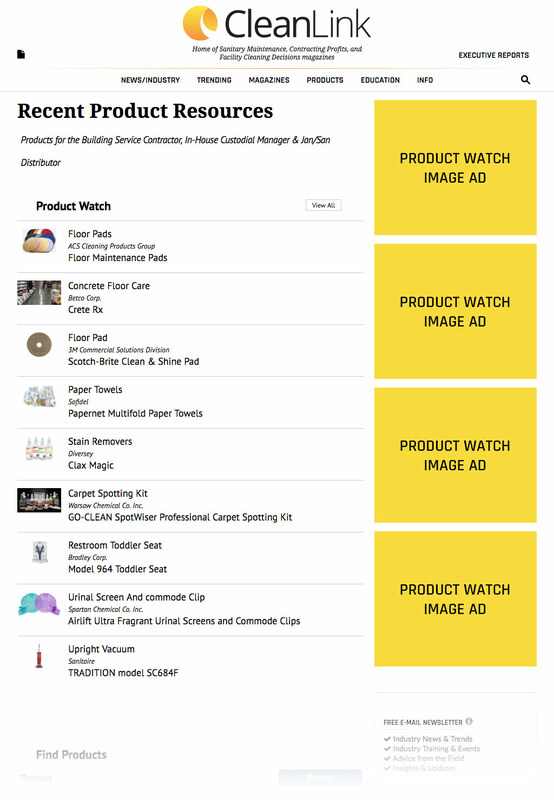 Your image ad is seen on all Product Watch pages including every product category and product profile. Make an unforgettable impression with a sticky ad. 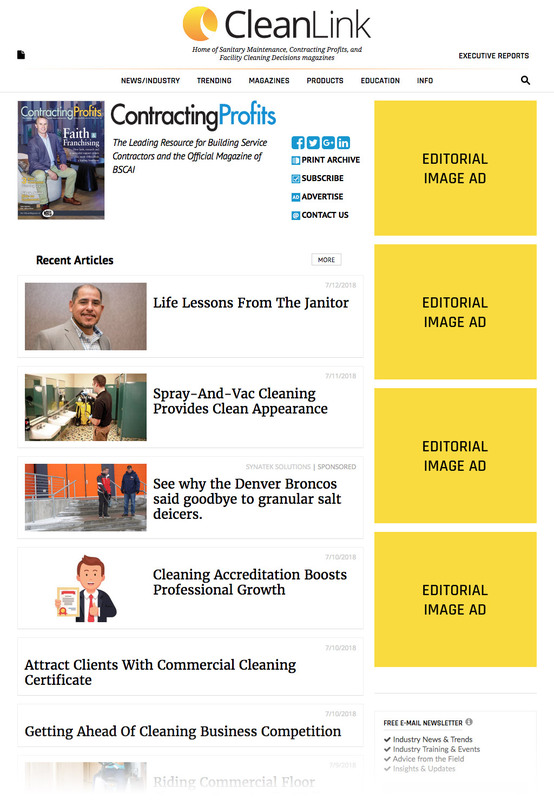 CleanLink's Catfish ad opportunity is a high-visibility way to promote your brand, repeatedly welcoming cleaning execs to the site. Talk about leaving a lasting impression! Video ads drive results. Create excitement and awareness for your products, bring more prospects to your Website, and increase sales by having your existing video featured on CleanLink. URL of video on YouTube. Video on YouTube must be shareable. URL ad should link to. Looking for an interactive ad experience where you can also gather data from potential customers in the cleaning industry? If so, try one of our easy-to-use poll ads. Our poll ads are a great way for you to gather data without needing additional IT support to generate a form. 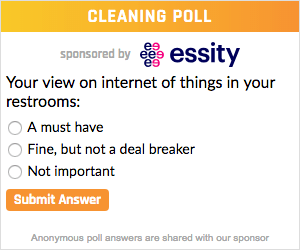 Having the form inside your ad on the site proves the best engagement for your poll. We offer three simple templates you can choose from to make setting up your poll easy. 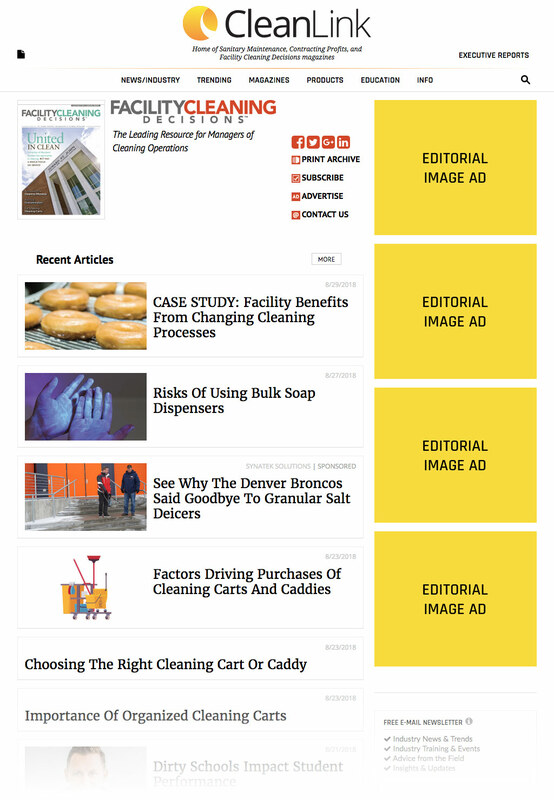 Poll ads can run in any Image Ad (300x250) placement on the website. The Image Ad placement cost plus $250 for set up and reporting. Grab audience attention while they're scrolling through content. Your ad loads dynamically into the right column of the page as the user scrolls down. Since the ad dynamically appears, more eyeballs are attracted to the new element placed on the page. Take your web ad to the next level. We remove the step of a click through landing page and have cleaning professionals engage right within your ad. Not only are you reaching our incredibly targeted and highly valuable cleaning audience, cleaning professionals can take actionable steps with your brand right on our site. It's an optimal way to use the content marketing assets you've already developed. It's Lead Gen. Our in-ad form approach, when used with your compelling content asset, delivers high-quality, user-requested leads right from a display ad. Since users are making a form-based request, you will get the cleaning professional's email allowing you to follow up with them. Based on our tests with this format, the in-ad form approach has out-performed traditional landing pages by 200%. Company Name: company name as it should appear in the ad. 30 characters max. PDF: send us the pdf the user should get after filling out the form. Should be optimized for digital. Ad text and pdf content are vetted for approval. Ad text must correspond to pdf content. PDF must deliver on expectations set from the ad. PDFs that are not high enough quality or purely advertorial in nature as to not deliver on expectations will not be accepted. As publisher we retain the right to refuse ad text or content asset as we see fit and as it relates to the best well being of our audience. Our data-analytics team has come up with a campaign approach to maximize ROI for this digital marketing standard. Combining our Lead-Gen Web Ads with eNewsletter exposure, this special package will help you get optimal results from a valued digital content asset. We create all the needed ads and run your campaign which promotes your content asset throughout our website and our eNewsletters for a month's time; this ensures your brand is seen by thousands of potential customers in the professional cleaning industry. You get the discounted campaign package price of $4,880 net for this complete turnkey program, which is valued at $6,250. If you don't have a content asset to offer, our experts can develop one for you to save you time. We will use our industry knowledge to craft something specifically for this audience. Our cleaning-industry content team will work with you to create a high-value asset which you can run with us and then use via additional channels for additional benefit. Ask your sales person for a quote. 2019 Cleaning Media Kit | Trade Press Media Group, Inc.